Freighter builds Tipping Skels to meet a range of customer requirements that can vary depending on operating conditions and types of goods carried. Illustrated on this page is the Freighter Sliding Tipping Skel. When on the road, the sliding chassis mechanism is fully extended to optimise axle load distribution and maximise payload. When unloading, the driver applies the truck brakes, releases the slider lock pins and reverses the truck to bring the container to the rear of the triaxle suspension for tipping to unload. 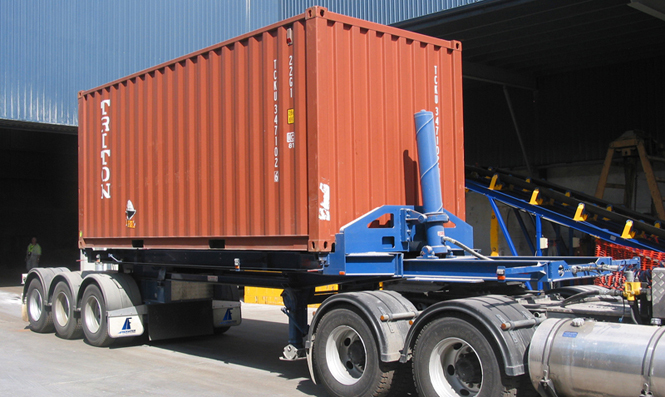 Freighter can also supply Tip Over Axle style tipping skels, depending on you specification requirements and application. Diesel or petrol hydraulic power pack to operate the lift ram when the truck has no hydraulic power supply available. A diverter is fitted to operate the hydraulics from the truck hydraulics when available. Rotary seal with diesel powered air supply (and hydraulic where required). Drop deck chassis to suit hazardous goods carriage. A range of heavy duty suspensions are available.